A while ago I was asked by a friend of my mums to give them some tips and ideas for a two week (ish) road trip in California during June. They were starting and finishing in LA and wanted to see San Francisco, Yosemite and experience some wine regions. My tips for them turned out to be so long and detailed I decided to share it as a post. Please note this was not written for people who are backpacking, instead for people of my parents generation. Los Angeles to San Francisco is connected by two main routes: the freeway (5) and the pacific coast highway (1). You can drive between the two in around six hours using the freeway but if you do it that fast you won’t see any of the sights – I would suggesting doing this for one leg of your journey if you need to do a loop around California and drop your rental car back in either LA or San Fran. Alternatively if you are just driving South to North or visa versa then I would suggest you’ll want to snake a bit more. The Pacific Coast Highway will take more like 10 hours of driving, the road is incredible – the views of the ocean last for the majority of the road, in places it is very windy and driving place is rather slow, but that is the best way to enjoy it. We didn’t visit downtown LA however did head over to Hollywood and Beverly Hills, it was as touristy as you would expect but it was fun to look at all the Hollywood stars on the ground and spot the sign up in the hills. 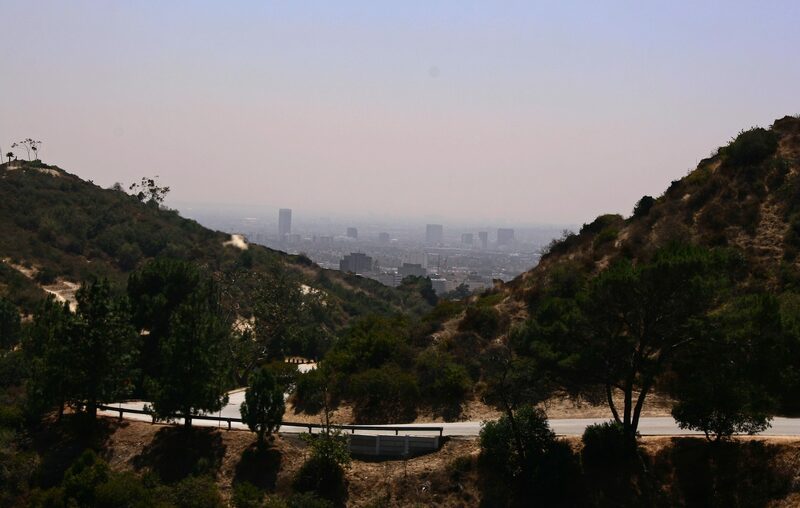 My favourite part of Hollywood was heading up in to the hills for a walk and the amazing view we got of LA. (We were trying to find the sign but failed) The park was called Runyon Canyon, there is more info here. We only visited Beverly Hills to be nosey and look at all the posh houses, not really worth it for anything else. There are plenty of beaches in LA, we visited Venice Beach and Santa Monica – these are so close you can walk between them. They have a very hippy vibe and a young crowd just hanging out, worth a visit just for the sunset they offer. I remember parking being easy to find in this area. There is also Long Beach, we never visited there but I know it is the another famous beach of LA. You could head south for a few days from LA to San Diego but as we didn’t do that I couldn’t give any recommendations. From Santa Monica you can pick up the start of Route 1 and begin to head north – we drove north on Route 1 and looking back I think north was better simply because we were on the inside of the road (furtherest away from the drop), however driving it either way is meant to be great. We drove through Malibu on our way out and then stopped in Ventura for the night. We didn’t see or do anything there as we were on the road early the next morning and only did so because we left LA very late that evening. Our first stop the next day was Santa Barbara on a sleepy Sunday morning. It felt very chilled, lots of places to grab coffee and snacks and the pier made for a good walk. According to Lonely Planet there is a wine region around here so this might be a good spot to have an over night stop and do some exploring, if wine is your kind of thing. 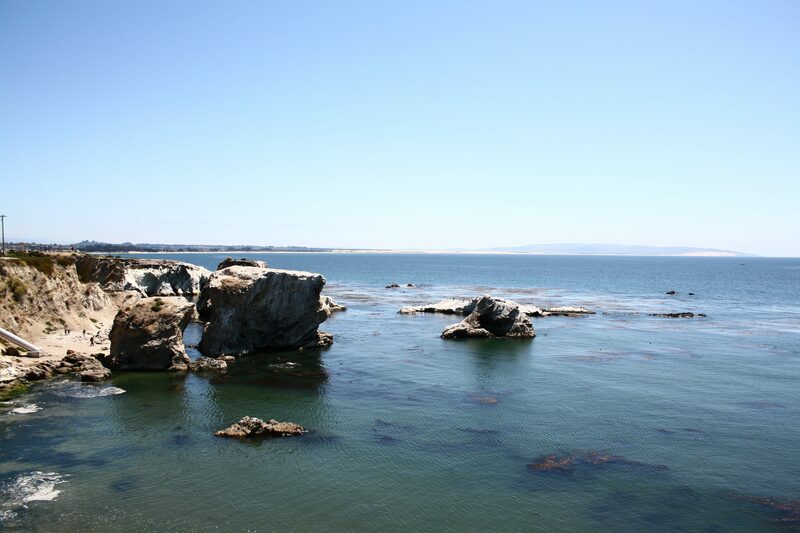 Head north from Santa Barbara and the next place worth stopping is Pismo Beach and Shell Beach. We just sat up on the cliff and ate lunch looking at the view but you could easily spend a bit of time wandering around this area. At points route 1 and 101 will merge into one road and this happens as you head north to the town of San Luis Obispo before turning back on to route 1 and heading towards the coast again. The next place worth mentioning is The Piedras Blancas rookery, seven miles north of San Simeon. Here you will find hundred of elephant seals basking on the beach. I remember the beach being sign posted and it being easy to find this spot. We drove Santa Barbara to Big Sur in one day, (around a five hour drive) as we were a little short on time because of our ambitious road trip we had ahead of us. I can’t suggest where to stop in between but would recommend doing so if you are not on such a tight time schedule. You can take your time with the driving a bit more and take plenty of stops – believe me you’ll want to! Of all of the places we stopped on the coast this was my favourite, I had read about this place for hours before hand and was so happy to finally visit. This area is beautiful, a huge state park and a small village. The coast is a sight itself with huge rock formations and purple sand (too dangerous for swimming in this area). 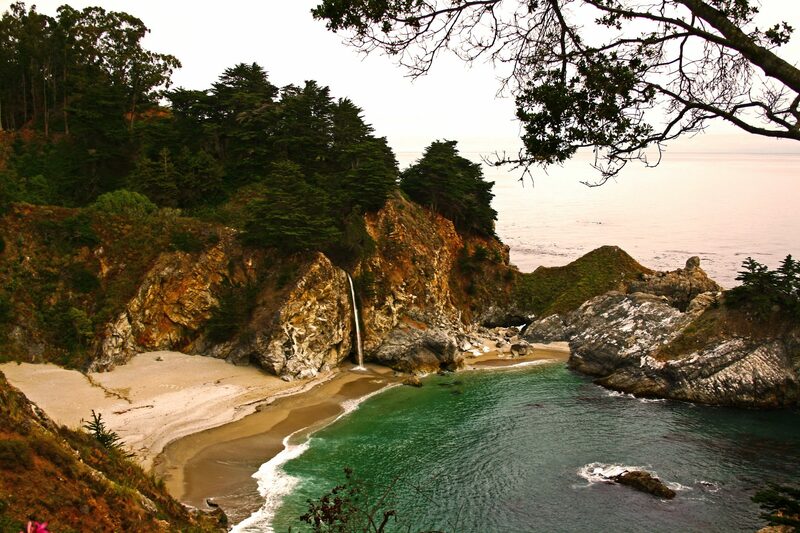 There is Mcway Falls, a waterfall that drops onto the beach – just a short walk to get there from the car park. There are lots of other walks and sights in this area. We stayed at riverside campground, a peaceful place with a stream running through – we camped but they also have cabins. Accommodation books up quickly in this area and there are a lot of high end places to stay – Post Ranch Inn would be the highlight of these but is $600+ per a night. Just north of Big Sur village you will find the famous Bixby Bridge, it gets cloudy early on so best to visit once the sun has burnt the cloud off. You will find the cloud does the same thing along many of the roads so don’t try setting off early for a drive as parts of the road can be covered with cloud and closed. There are few places to eat and drink out in Big Sur and the supermarket is small so best to stock up on supplies before you arrive. I would certainly suggest spending a night here, if not two. We only touched on these two places but they are two of the highest rated places by many blog and guide book. I remember Carmel-by-the-sea being a very pretty town with lots of quaint shops – not quite the scene of the people I was travelling with but I can imagine it being a place many would enjoy. Although it is only a short drive to the Monterey peninsula from Big Sur this would make another great spot for an overnight stop – we stopped slightly further north in Santa Cruz, more on that in a moment. This area is typical seaside towns of America, plenty of beautiful scenery and a 17 mile scenic drive. Is a very fun and hippie city, the downtown felt very touristy and lacked anything to do except shop for surfboards. The beach is pleasant, very busy with people and lots to watch. We sat for a long while watching people play volleyball. It is suppose to be a city of amazing surfing but we never experienced this, however could be a nice spot to watch some of the best surfers. Apart from this we found little to keep us entertained in Santa Cruz and our highlight was camping in New Brighton state park which had a beautiful beach. Between San Fran lies Half Moon Bay and Pacifica beach which are nice, again more surfing but also a very friendly and local beach. Worth a last stop on the beach before hitting the city and going inland. I’m not a huge city fan but I absolutely love this city. Set around the water and so much to see and do. 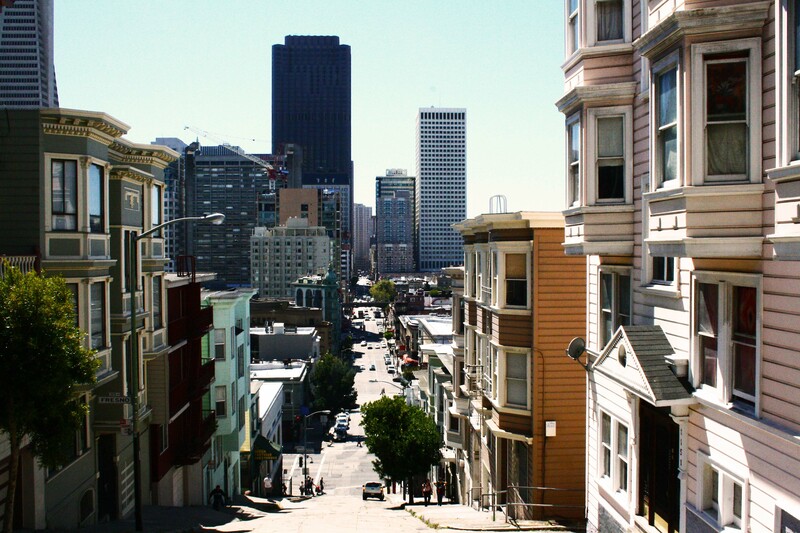 We stayed downtown in San Fran at Adelaide Hostel and couldn’t have been in a better location. We parked the car away at a garage for a few days and explored on foot. Walking around the main city as well as along the water to the Golden Gate bridge (although we did take the bus back). There are plenty of tours you can do and if you want to do a bus tour I would recommend Big Bus Tours, we used them in New York and they were brilliant. If you want to go to Alcatraz book tickets MONTHS in advance, it sells out so quick. I have read plenty of reviews and would say it is very worth it. I would also suggest a cruise around the water during sunset which takes in the bridge – heard some good reviews of these. Golden gate park is suppose to be beautiful, although you would need to grab the car to head over there, the view from the west side of the Golden Gate bridge is suppose to be worth it as well. Take a ride on the trams in the city even if it is just to say you’ve done it, it is also fun to watch them turn around on the turn tables. There are countless hills in San Fran, but the grid systems makes it easy to find your way around. I would definitely recommend a trip to the Fishermans wharf, fresh seafood and lots of quirky attractions – although is a little touristy. We then walked from there to the Golden Gate Bridge which was a lovely but long walk, so wouldn’t suggest walking back as well. The Gate is often covered by cloud and makes the city feel much colder around that area, make sure you wrap up in layers unlike we did. We walked a little way out across the bridge but I wouldn’t say you need to walk all the way across. I would suggest the Coit Tower for a good lookout spot as well as the steep journey up to Coolbrith Park for a fab view. One of my favourite travel bloggers went to San Fran at the end of 2014 so a look here might inspire you a bit more and help with accommodation suggets. This was probably my highlight of California, with only Monument Valley and the Grand Canyon being better from our whole American West road trip. The only down side is bush fires and bears are a high risk in the area. When we visited there was a controlled bush fire, it didn’t affect our stay but did make parts of the valley very foggy with smoke. Even the drive from San Fran to Yosemite is beautifully and you reach the national park much earlier than the valley itself, expect to stop regularly to take in the view. We stayed down in the valley and had a wonderful time just exploring that area, however when we drove away the following day across the park to exit on the east side – those were some of the best views. Back to the Valley – There is plenty of walking in the national park and you could easily spend a week here taking in some of the walking but that all depends on fitness levels (some of them are very tough) and what you want from your holiday. We just did one small walk called the mirror lake walk, it wasn’t very long (2 miles) but was very pretty. The valley is full of waterfalls and there is so much to do throughout the valley let alone exploring the rest of the park. We camped in the valley however there are several cabins, lodges and hotels listed but I would assume these get booked up rather fast so be sure to book ahead for peek times. We ate an amazing buffet at the curry village dining pavilion but there was an abundance of places to eat and drink. There are bears in Yosemite. so you need to be careful after dark and make sure you don’t leave food or toiletries in the car! Plenty of info to keep everything safe all around the park. Keep some time to drive east on the 120 highway before heading out of the park as this is where some of the best views lie. Yosemite Valley also offer horse riding however booking in advance is advised. I unfortunately cannot recommend anything about the wine valleys because I wasn’t actually old enough to drink in the states, so we skipped out all of those areas. Does anyone have any wine valley tips for California I can share?? In terms of days and nights I would suggest a stop in Santa Barbara, Big Sur, Monterey Bay then several nights in San Francisco before hitting Yosemite for several more. This would then give you time for the wine valleys as you make your way back to LA. GET A SAT NAV, if you can’t rent one with the car then consider buying a cheap one from an electronics store as they aren’t too expensive. Also pick up some maps of the area you will be driving for when the sat nav fails. Driving in America is so much easier than the UK and we barely got lost but it was nice to just know where we were by looking at the map. AirBnB if you fancy something a little different. Through this website you can book out an entire apartment or home to a private room in someone’s house. We did just that in Greece and stayed with a wonderful host who shared knowledge with us we wouldn’t have otherwise known. We will do the same thing this year, and are looking at renting out a full apartment for a quite week but also a private room for a city break. I find it a fantastic way to get a different perspective of a place. I am a lover of Lonely Planet and always book places recommended by them, I do however always check reviews on trip advisor before booking any hotels, hostels etc. I typically book hotels through their own site, I have also found that booking accommodation 3 months out can get you good discounts. RoadTrippers – a great site for planning road trips in America. VISIT CALIFORNIA – The tourism website, I often find the tourism websites to be very useful. Do you have any more suggestions for a two week road trip in California? This is so on my to do list!! Great post. Nice tips Jodie. I did a road trip from San Francisco to San Diego with my family years ago, and we stopped at most of the same places. I would love to do it again! Thanks Christine, It really is a wonderful part of the world and an amazing place to road trip – I would love to have headed south to San Diego. Hey Jodie. Nice post. It’s so informative. Fair play to you.. And nice blog too. Thanks SO much for the shout out and blogger love 🙂 Much appreciated and glad to help. A road trip in California is a definite must! Sonoma County is a great detour to the wine regions – really good food, wine and friendly people. Now that’s definitely one trip for the books! I’d love to be able to do this someday. The pictures look stunning! Very informative write-up, too. I am so inspired! I am heading off to California this summer with my family and we are just starting to plan our trip so this is very useful! Thank you! Glad you found them useful 🙂 If you have an more questions ask away..